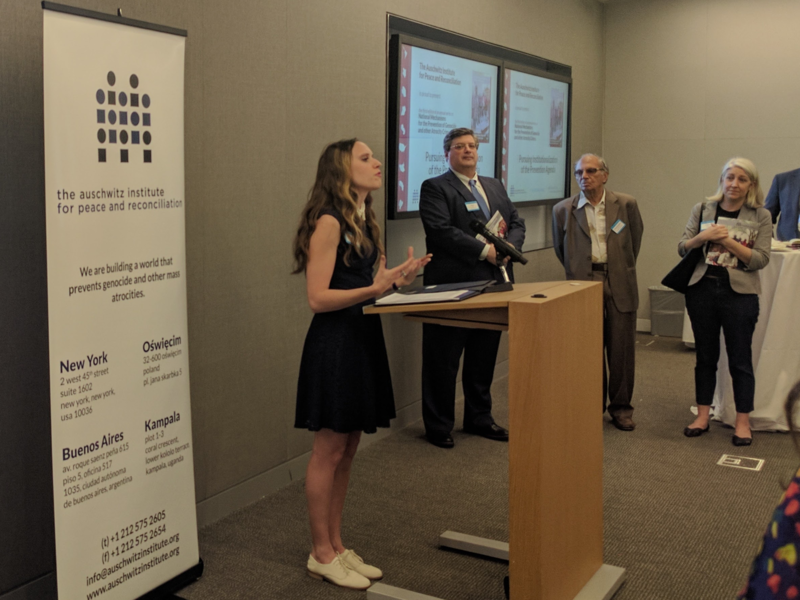 On May 16, 2017, the Auschwitz Institute for Peace and Reconciliation (AIPR) held a launch event for the 2017 edition of its Booklet on National Mechanisms for the Prevention of Genocide and other Atrocity Crimes at White & Case LLP in New York. The third entry in the annual publication series produced by AIPR, this year’s booklet is entitled “Pursuing Institutionalization of the Prevention Agenda” and includes a thematic focus on the challenges and constraints faced by National Mechanisms as a result of their lack of formal legal integration into the budgetary architecture of the state. The 2017 edition of the Booklet on National Mechanisms, developed in collaboration with a team of graduate students from Columbia University’s School of International and Public Affairs, re-examines the current state and recent activities of National Mechanisms around the world and emphasizes the necessity of their formal institutionalization into structures of government in such a way that would grant them the necessary resources for consistent and effective work on the prevention of genocide and other mass atrocities. The Booklet’s launch event was opened by Ms. Samantha Capicotto, the Auschwitz Institute’s Director of Policy and Planning, who introduced the new edition of the Booklet and gave a brief overview of AIPR’s objectives in producing the publication, noting that the success of National Mechanisms is determined not simply by their creation, but by their functions as a vital element within a “whole of government” approach to prevention at the national level. 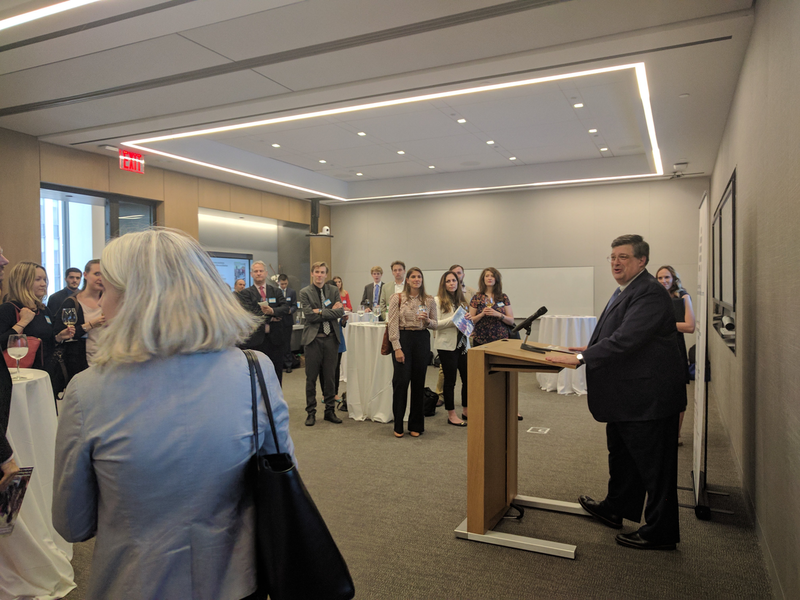 Mr. Owen Pell, Partner at White & Case LLP and President of AIPR’s Board of Directors, spoke next, emphasizing the important work being done by the National Mechanisms and contextualizing it within the broader field of genocide and mass atrocity prevention. For him, efforts that place an emphasis on fostering transparency and dialogue represent an essential enabler of the continued growth of prevention efforts around the world. Dr. Ariella Lang, Associate Director of the Institute for the Study of Human Rights at Columbia University and Capstone Project Facilitator for the cohort of graduate students who contributed to the development of the 2017 Booklet on National Mechanisms, followed with remarks on the interest of Columbia University in offering opportunities to their students to contribute to projects, like the compilation and publication of the National Mechanisms Booklet, that look to make an impact on a global scale. 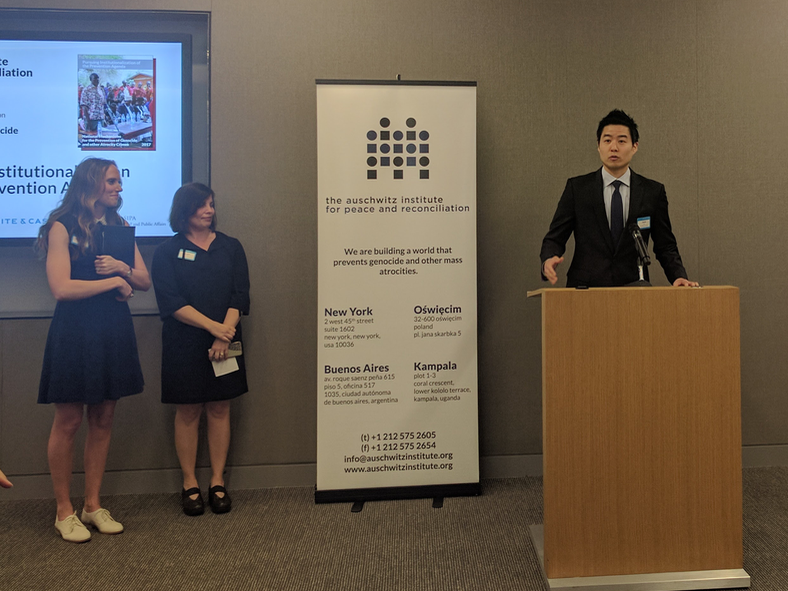 Mr. David Yoon Sik Jo, one of the contributing graduate students, concluded the event by making remarks on behalf of his colleagues and discussing his experiences working with members of the featured National Mechanisms and his fellow students over the preceding months. The 2017 Booklet on National Mechanisms for the Prevention of Genocide and other Atrocity Crimes can be accessed from AIPR’s publications page or by clicking here to download it directly. If you have any questions about the Booklet or would like more information on the Mechanisms contained within, please contact Samantha Capicotto at samantha.capicotto@auschwitzinstitute.org.